A fast moving & easy Movie Maker tutorial for beginners. Learn how to do a Windows Movie Maker split video editing and Windows Movie Maker trim video editing too. See how Windows Movie Maker effects like animation and transitions can give your movie video a profession look and feel. Windows Movie Maker is free and allows you to edit, trim and split video easily without costly software. Windows Movie Maker for Windows 10 still works in Microsoft newest Windows 10 operating system. The free video editing software is easy to get and easy to use. Please keep in mind it’s easy to see how to use Windows Movie Maker in my video, to do more than just split and trim editing. 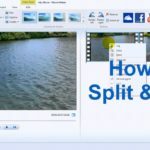 Watching my video will show you how to split a video in Windows Movie Maker without special software. And lets not forget how to trim videos on Windows Movie Maker too. It’s fun and easy to do using the Windows Movie Maker trim tool that I called the „video editing guide tool“ in my video. Newest on Windows Movie Maker, directly from Microsoft Website: Quote „Windows Movie Maker is not supported for Windows 10, but you can still download Movie Maker if you really want it“. End of Quote.